The International Energy Agency (IEA) released its World Energy Outlook 2018 (WEO) on November 13. This year’s WEO, which projects supply and demand for global energy through 2040, finds that major transformations are underway for the global energy sector, including growing electrification, the expansion of renewables, upheavals in oil production, and the globalization of natural gas markets. It is important to note that these forecasts are projections, and that IEA’s forecast is but one of many that are provided annually attempting to view the world’s future energy delivery system using current trends and assumptions. Under current and planned policies assumed in the New Policies Scenario, energy demand is projected to grow by over 25 percent to 2040, due to rising incomes and an additional 1.7 billion people. The higher energy demand will require more than $2 trillion a year of investment in new energy supply. Further, IEA projects that demand markets will shift by 2040. In 2000, over 40 percent of global demand was in Europe and North America with about 20 percent in developing economies in Asia. By 2040, this trend is reversed. The graph below shows how demand for major fuels is changing between industrialized and developing countries in IEA’s forecast. Asia makes up half of the global growth in natural gas, 60 percent of the increase in wind and solar photovoltaics, over 80 percent of the increase in oil, and over 100 percent of the growth in coal and nuclear power. Electricity demand is expected to grow based on the digital economy, electric vehicles, and other technological change. The share of electricity from nuclear plants—the second largest source of low carbon electricity today after hydropower—remains around 10 percent, but the geography changes as nuclear generation in China overtakes that of the United States and the European Union before 2030. In the generating sector, renewable energy becomes the technology of choice, making up almost two-thirds of global capacity additions to 2040 due to falling costs and government policies. The share of renewable energy in the generating sector is expected to increase to over 40 percent by 2040, from 25 percent today. The increasing competitiveness of solar photovoltaics pushes its installed capacity past wind before 2025, past hydropower around 2030, and past coal before 2040. The majority of the solar is utility-scale, but investment in solar by households and businesses play a supporting role. New solar photovoltaics outcompete new coal almost everywhere in the IEA forecasts, however, solar fails to compete with existing thermal plants without the help of government policy. As countries around the world ramp up their share of solar photovoltaics and wind, IEA finds that the electricity sector will need market reforms, grid investments, and demand-response technologies, such as smart meters and battery storage technologies. The WEO forecasts increasing oil consumption due to rising petrochemicals, trucking, and aviation demand. The IEA expects oil demand to grow by around one million barrels a day on average to 2025, after which it slows to around 250,000 barrels a day. Demand growth through 2025 is expected to be driven by China, and from the late 2020s to 2040 by India and the Middle East. Oil consumption for cars peaks in the forecast in the mid-2020s. Improvements in fuel efficiency in the conventional car fleet reduce potential demand by three times more than the 3 million barrels per day displaced by 300 million electric cars in 2040. To meet the growth in oil demand, IEA projects that conventional oil projects would need to double from their current levels. Without such an investment, U.S. shale production would need to add over 10 million barrels a day from today to 2025, the equivalent of adding another Russia to global supply in seven years— which would be historically unprecedented. As a result, IEA expects a sharp tightening in oil markets in the 2020s. In the New Policies Scenario, the United States accounts for over half of global oil and natural gas production growth to 2025 (almost 75 percent for oil and 40 percent for natural gas). By 2025, nearly every fifth barrel of oil and every fourth cubic meter of natural gas is expected to come from the United States. Growth is expected to be driven primarily by hydraulic fracturing in shale basins, which should lead U.S. shale oil supply to more than double, reaching 9.2 million barrels a day by the mid-2020s. U.S. shale oil production is expected to plateau in the mid-2020s, and fall by 1.5 million barrels a day in the 2030s as a result of resource constraints. After 2025, the outlook is for OPEC to meet continued growth in global oil demand. Demand for natural gas increases as China becomes a large consumer. Natural gas overtakes coal in 2030 to become the second-largest fuel in the global energy mix. Industrial consumers make the largest contribution to a 45 percent increase in worldwide gas use. Trade in liquefied natural gas (LNG) more than doubles due to increasing demand in developing economies. Russia is expected to remain the world’s largest natural gas exporter as it opens new routes to Asian markets. In the New Policies Scenario, energy-related global carbon dioxide emissions continue to grow and IEA projects that they will reach a new record high in 2018. Coal-fired power plants, which account for one-third of energy-related CO2 emissions today, represent over a third of cumulative locked-in emissions to 2040. The vast majority is related to projects in Asia, where coal plants average just 11 years-of-age and have decades more to operate, compared with an average age of 40 years in the United States and Europe. 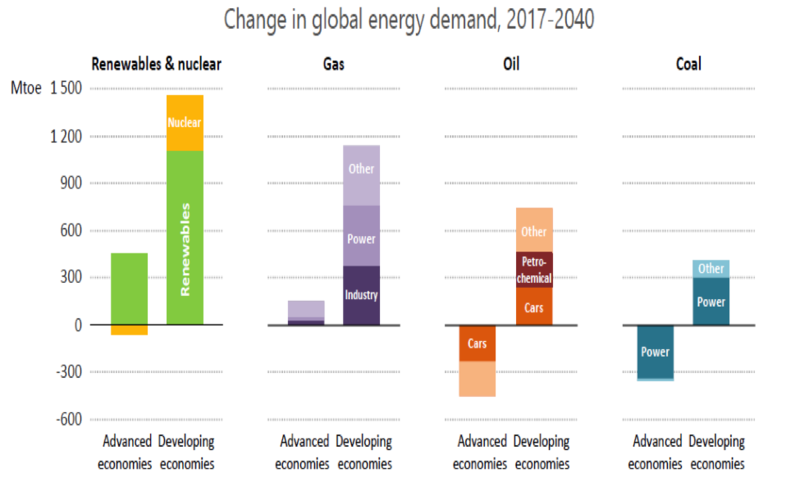 IEA’s forecasts under current and planned policies show continued growth in global energy demand, as well as natural gas, oil, and renewable energy. China leads the countries of the world in energy demand through 2040, followed by the United States, and India. As a result of the increased demand, carbon dioxide emissions also continue to increase. Further, the IEA expects the United States to provide 50 percent of the oil and natural gas production growth through 2025, with U.S. shale oil doubling its production by the mid-2020s. With more energy to meet growing demand, people around the world will leverage its “capacity to do work” to improve the lives of themselves and their nations.